A regional emergency has been declared by the Federal Motor Carrier Safety Administration (FMCSA) in response to the potential impact of Hurricane Florence on the Eastern Seaboard, easing restrictions on motor carriers who provide emergency assistance. Under 49 CFR §390.23, motor carriers and commercial drivers who “provide emergency relief during an emergency” are exempt from the Federal Motor Carrier Safety Regulations (FMCSR) in 49 CFR Parts 390 through 399. This includes such requirements as hours of service and driver qualifications. The affected states and jurisdictions included in the emergency declaration are Delaware, the District of Columbia, Florida, Georgia, Maryland, New Jersey, New York, North Carolina, Pennsylvania, South Carolina, Virginia, and West Virginia. Emergency – any severe event (hurricane, tornado, high water, earthquake, drought, or blackout) or other natural or man-made occurrence which interrupts the delivery of essential services such as electricity, medical care, sewer, water, telecommunications, or essential supplies such as food and fuel, or otherwise threatens human life or public welfare. The key to the definition, however, is that the event MUST result in a declaration of emergency from the president, a governor, or the FMCSA, although tow-truck drivers can be exempt if there is a police request for tow trucks. Emergency relief – an operation in which a motor carrier or driver is providing “direct assistance” to add to state and local efforts and capabilities to save lives or property or to protect public health and safety during an emergency. Direct assistance – transportation and other relief services provided by a motor carrier or driver related to the immediate restoration of essential services or supplies. It does not include transportation related to long-term rehabilitation of damaged physical infrastructure or routine commercial deliveries after the initial threat to life and property has passed. “Direct assistance” ends when a driver or commercial motor vehicle (CMV) is used in interstate commerce to transport cargo not destined for the emergency relief effort, or when the motor carrier dispatches the driver or CMV to another location to begin operations in commerce. Relief from the Federal Motor Carrier Safety Regulations (FMSCR) is limited to a maximum of 30 days, through October 10, unless extended by the FMCSA itself. Refer to current emergency declarations listed at www.fmcsa.dot.gov/emergency. Drivers eligible for the exemption are exempt in all states on their route to the emergency, even if those states are not involved in the emergency or stated in the declaration of emergency. The federal exemption, when in effect, only applies to certain safety regulations. You still must comply with CDL, drug/alcohol, hazardous materials, size and weight, insurance, and state/federal registration and tax requirements, unless a governor's emergency declaration specifically adds one or more of those exemptions. Even if an emergency declaration is still in effect, the emergency must be ongoing and you must be providing direct emergency relief to be exempt from safety regulations. Even though safety regulations may be suspended, the FMCSA expects drivers and carriers to use good judgment and not operate vehicles with fatigued or ill drivers, or under any conditions presenting a clear hazard to other motorists using the highways. At the roadside, a driver may be asked to prove that he/she is exempt. The bill of lading, invoice, or other shipping document describing the cargo should be sufficient for this. Law enforcement officers are expected to give the benefit of the doubt if they can't really be certain that a load is destined for emergency relief. Drivers are NOT required to log their hours while providing direct assistance. However, drivers should keep track of their total time providing direct assistance so that they can satisfy the requirements of §390.23(b) and (c) with regards to returning to duty once they’re done providing direct assistance. After emergency work is complete, drivers are again subject to the regulations, with one exception: a driver may return empty to the motor carrier's terminal or the driver's normal work reporting location without complying with Parts 390-399. However, a driver who tells the motor carrier that he or she needs immediate rest must be given at least 10 consecutive hours off duty before being required to return to the terminal or other location. To return to regular duty, the driver must comply with the driving, on-duty, and off-duty limits (§§395.3(a) and 395.5(a)). If the driver has been on duty for more than 60/70 hours in any 7/8 consecutive days, then the driver may need at least 34 consecutive hours off duty. 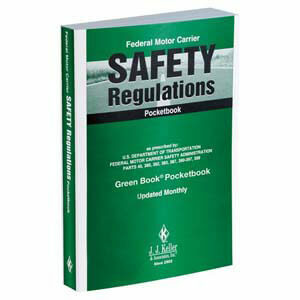 J. J. Keller's Federal Motor Carrier Safety Regulations Pocketbook gives your drivers easy access to word-for-word Federal Motor Carrier Safety Regulations (FMCSRs) in a convenient pocketbook format.